You are here: Home > Blog > Energy, sustainability & economics > Woodlands come in many forms. However, it is possible to recognise many different types of woodland in the U.K. How these are described or categorised varies. There is, for example, the Peterken system of stand types* – this is based on the presence of long established tree species. It has 12 main (and 39 subsiduary) types of woodland. Then, there is the National Vegetation Classification (the subject of a blog some time back) - this recognises some 50 different woodland communities e.g. Fagus sylvatica – Mercurialis perennis woodland, i.e. beech & dog's mercury. There is also the system that was devised to identify U.K.Priority Habitat Types † – this recognises some nine types of woodland based upon threat, need for conservation and vulnerability. However, these are quite technical systems – so, 'the blog' will discuss some of the “main types” of woodland (found in the U.K.) based on the main tree species present, but also considering climate and geology / soil type. 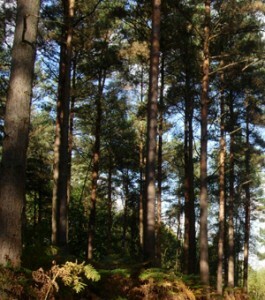 Climate and geology (soil type) are the main influences on the character and distribution of woodland in a given area. Oak is the most common, dominant tree species in established woodland that forms on acid soils and rocks. Ash is found on limestone and chalk, and sometimes on moist soils. Wych elm and small leaved lime also 'like' calcareous areas. Alder 'likes' water and is associated with rivers, riparian systems - as does willow. Where conditions are 'harsh' (temperature / wind) such as the Highlands - then species such as Scots Pine and birches are found (and are dominant). 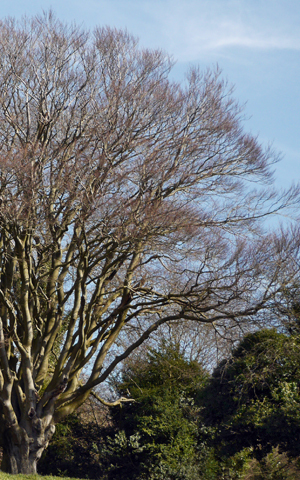 Species such as hornbeam, field maple and beech are mainly found in southern parts of the U.K. and beech may be found on drought prone, 'thin' soils (though a severe drought, like that of 1976, may kill them). 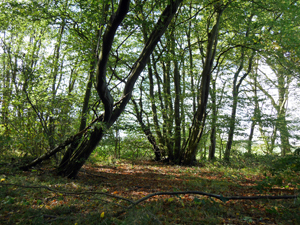 Human intervention / management of woodlands has been an ongoing process (since neolithic times) and the 'favouring" of particular species in certain areas is not uncommon - thus beech has been 'favoured' in parts for furniture making. Planting of particular species also changes the nature of a woodland, for example, the introduction of non-native species such as horse chestnut. So, just as the blog has ‘visited’ atlantic woods and Caledonian forest so it will now look at other woods : beech woodland, yew woods, wet woodlands etc. * PETERKEN, G. P. 1981 Woodland Conservation and Management.